ATN tapped the services of LJMB “Learning Just Made Better” Management Consultancy Services in building the ATN Performance Management System (PMS). Together with ATN’s CEO, all ATN Managers, Supervisors and Section Heads attended 3 Saturday sessions for the orientation and crafting of the organizational, departmental and individual Key Result Areas (KRA), Key Performance Indicators (KPI) and Key Performance Objectives (KPO). After the 3 Saturday sessions, a PMS kick-off activity was organized last 05 April 2011 at the Microtel Hotel MOA to communicate to the staff the objectives, benefits and cycle of the PMS. The roles and responsibilities in PMS were also tackled. 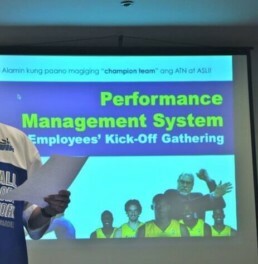 Since excellence is a value that all are enjoined to strive for in the workplace, the ATN Management has agreed to implement this new Management System to allow more measurability in performance efforts and outputs. This is also one way for the company to continue the culture that it has built over the past 25 years — the culture of welcoming challenges and desiring to improve. During the PMS Kick-Off, each department presented their respective “dreams and aspirations” for the company. The event was filled with excitement and energy as the staff came prepared for the sports outfit contest and departmental cheer competition.